Note : The long-awaited first full-length release by the new group comprising Gift of Gab, Lateef The Truth Speaker and Headnodic of Crown City Rockers. 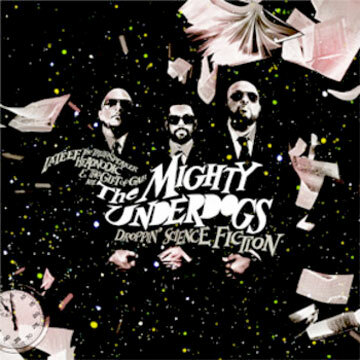 Hip-hop super-group, The Mighty Underdogs, comprised of members of Blackalicious, Quannum Projects, and Crown City Rockers, are proud to release their first record on Definitive Jux...."Droppin' Science Fiction". The collaboration also features contributions from such luminaries as DJ Shadow, Mr. Lif, Damian "JR Gong" Marley, and MF Doom, among others. "Dropping.."'s other-worldly atmosphere is one where Monsters have gun fights in old west towns, identities are kept secret as a principle, and not all super heroes' intentions are what they seem. The release date is October 14, 2008, and they have a tour supporting friends DJ Shadow and Cut Chemist in July (Dates Below).